Wow, last week’s Fury of Firestorm: The Nuclear Man #14 was fantastic!!! Dan Jurgens, Ray McCarthy, and Hi-Fi Color knocked this issue out of the park! The action and drama continue to unfold, and the artwork is great! I really like the way they are developing the Firestorm character, as well as Ronnie and Jason’s relationship. It feels like these are strong building blocks to build future stories. If you’d like to read Dan Jurgens thoughts on issue #14, swing over to Comic Book.com and read his recent interview on this issue. While I’m enjoying the current storyline, I’m getting anxious to see some classic rogues. I hope Dan Jurgens is on the book long enough give us characters like Killer Frost or Multiplex (or maybe even Slipknot). What concerns me is if the series will survive. I’m sure you already know sales were low on the Firestorm series as compared to other New 52 series. Many of us were hoping to see an upward spike in sales with Dan Jurgens arrival on issue #13. Unfortunately, that wasn’t the case. According to Comic Chronicles, Fury of Firestorm #13 in October had the lowest sales yet. To be fair, these numbers are not completely conclusive. These are solely based upon the sales of Diamond Comic Distributors and doesn’t include other distributors or digital sales. 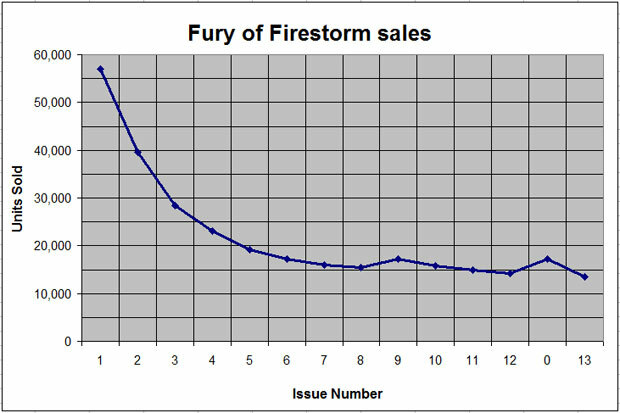 Below is a chart I’ve been using to track the sales of Fury of Firestorm since issue #1. So what does this chart tell us? It’s more important than ever that you get out there and encourage people to try recent issues of Fury of Firestorm! The series features a return to one singular Firestorm, something many long-term fans have been demanding. Well, if they don’t give the newer issues of the series a try, its possible it might not last. So get out there and fan the flame! Finally, DC Comics recently released a very different cover to The Fury of Firestorm: The Nuclear Man #15! See the cover below and check it out over on ComicBook.com. Posted in: Dan Jurgens, Firestorm #10: New 52 v2 (Ronnie/Jason), Firestorm comic vol. IV. Well, I’ve bought duplicates the last two issues. So I’m trying to do my part! You know I’m dying for classic rogues but solicitations still have that possiblility at 4 months away at least and thats disturbing. 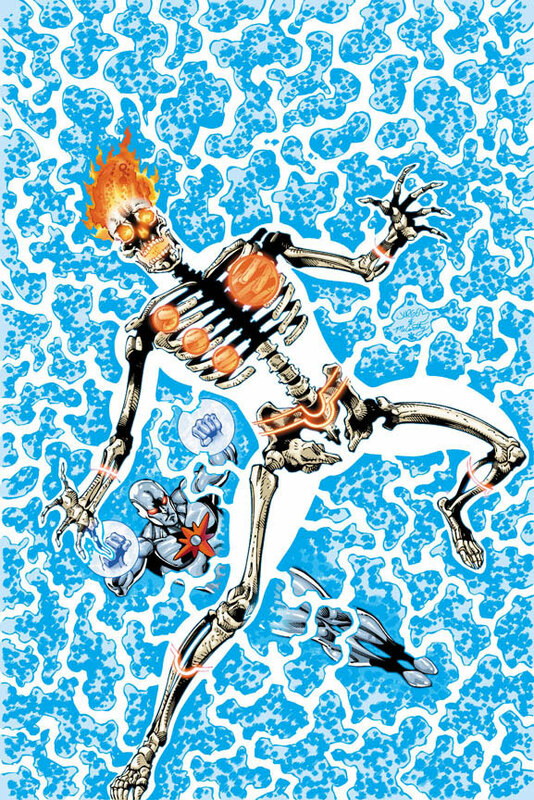 As a kid I always thought Captain Atom looked like the Silver Surfer with hair and a symbol on his chest. Now he looks even more like the Silver Surfer. Those numbers may not be great but they look like they’ve predictably levelled out. There isn’t a whole lot of change in the last 8 or 9 issues, which means we may be down to the truly faithful readers. I see that as being promising. Now the writers have their baseline they can try to focus on strong storytelling to get new people on board who may have stopped reading other lines. Looking at those numbers, cancellation seems inevitable by issue #18. As comparison: JLI was selling double these numbers, and not only was it canceled, they killed off half the team! Hopefully, even in the worst-case scenario, Firestorm gets a quick axe so that the characters can return in the future. DC’s current strategy of “let’s throw it all against the wall and see what sticks” would indicate that they’d rather let the title be replaced by something new than make any real attempt at resuscitation. Not that I want to see FIRESTORM go away, mind you, but if we want to see the title or characters stick around, fans need to start making some noise. The problem is DC should have started with this version of Firestorm. This is the version everyone wanted. But instead they allowed the concept to get mucked up with watered down versions of what was an original character. In my opinion, Firestorm is a character that is hard to get wrong, yet for almost a decade now, Dan Didio has been doing just that. First with a horrible bait and switch (giving us Jason Rusch when we wanted Ronnie Raymond) and just as they were about to get it right again, the kill Martin Stein and then reboot Firestorm completely, leaving plotpoints dangling from Brightest Day, with a ridiculously overly-complicated and political storyline. I do think, unfortunately, the damage has probably been done to this series. The only hope for the series is that it has indeed found its baseline and this baseline is acceptable to the powers that be. I don’t know what it means that Jurgens’s first issue sold even worse than its predecessors. All I can possibly attribute that to is reboot fatigue. That even if it’s a reboot that goes in a positive direction, it’s still a reboot. They had their chance for one more Firestorm reboot with issue #1 of the series, and they blew it. Keeping in mind that Firestorm is a character that has probably been rebooted nine times since his original inception. Maybe the character needs to go away for a little while— YET AGAIN— before coming back with a new lease on life. Sigh. Hey, I read the new 52 firestorm book, Ronnie is my favorite and Jason is awesome as well. So I also really like this character Felicity smoak on Arrow, she is awesome. She is actually the reason I initially tried new 52 firestorm and has taken an interest in this superhero and his comics, though she isnt in it at least not yet, I stayed because Ronnie & Jason are interesting characters. Please recommend me old comics where the character of Felicity is mostly in. (As well as other comics with Ed raymond bonding with Ronnie). Where can I get the comics from, its extremely hard to get such old comics. Tried comixology and they don’t have the specific issues I want,( like where felicity/edward/ronnie are in together). Would really appreciate the help. Sorry had to ask here, wanted to ask on tumbrl but there was no ask. Hope you dont mind I asked here. thanks. Yeah also I would love to see Ronnie & Edward Raymond in the Arrow show. Maybe Jason too and professor stein can guest star. I dont think that it was just a coincidence they have the character of Felicity. In the show she looks exactly as she does in the comics, so yeah I think they are aware of the character’s presence in firestorm. I’m hoping they bring some firestorm mythology in the series. Cant wait. Thanks for all the comments! In case anyone is wondering, we haven’t heard anything about FIRESTORM being canceled, we’re only speculating. Please support the book in any way possible. The best way to ensure continued Firestorm comics is to buy the current series and encourage others to as well! @Charlemagne – Keep up the good work! You rock! @Craig – Captain Atom/Silver Surfer is mentioned in the Comic Book interview with Dan Jurgens. Check it out! @Outburst – I hope that is the case, but my concern is the baseline is significantly behind the majority of other DC comics. Firestorm is one of the comics regularly at the bottom of the DC sales charts. @Boosterrific – I figured you’d especially like the graph. Yes, cancellation at issue #18 seems logical. Issues 13-18 would make a nice trade paperback. If so, then it makes sense to cancel at 18. @nWoJeffDW – I think each incarnation of Firestorm features redeeming qualities. I know you’re a Ronnie/Martin purest, but I think there is a lot of value in the Ronnie/Jason Firestorm (whether it be from Brightest Day or current version). With that said, I wish Martin Stein was still alive, even if he was just a supporting character. @Martin Stein RIP – You may be right. Loosing so many readers early on made it very hard to recapture them. Maybe a few years away will build some demand. Or perhaps they should stick Firestorm on the Teen Titans or JLA, then build some new fandom, then try again with a new FIRESTORM #1 in a few years. If you have trouble finding the comics locally, try an online retailer like Mile High Comics. Hope this helps and thanks for commenting! Alright thanks for replying, I will try mile high, I had not checked than one out yet. And yeah i want to read her first appearance, so thanks for the recomendation. I just “can’t” like this new book no matter how much I’ve tried…. Maybe its the reboot fatigue…maybe its feeling burned constantly by DC/Dido….maybe its buying Brightest Day/Darkest Night and feeling i got robbed of my money…maybe its Ethan and Gails poor portrayal of this character…maybe its DC saying that Martin Stein HAS to be dead, but aren’t given a reason why…maybe it going into 14 issues and we still haven’t seen a original Firestorm Rogue…Maybe its just everything…. Everything that I loved about the character is gone…Jurgens (bless his heart) is trying to put the love back into this book, but it all feels forced and it’s all being done too quickly (I’m assuming because issue 18 will be the last). I really have tried to like Dan Jurgens take on this series….but as it was mentioned, maybe this character needs to “disappear for a few years” before I’m excited again. I just can’t in good conscience give DC more money for junk books. I’ve been patient and forgiving with the decisions Didio/DC has made on Firestorm for probably the last 6 years…..and this New 52 version, I just can’t forgive anymore……for now…it’s just not in me. Mainly because they don’t have what i call a perceived “direction” for the New 52. As it was stated, DC seems like they are throwing ideas against a wall to see what sticks, which doesn’t seem like much. I’ve said before, they could have the lead character be Mikhail Arkadin merging with an old Buick; if it’s a book called Firestorm, I’m in for the duration. I’m actually quite glad that Jurgens’ direction is as enjoyable as it is, for as long as it lasts.